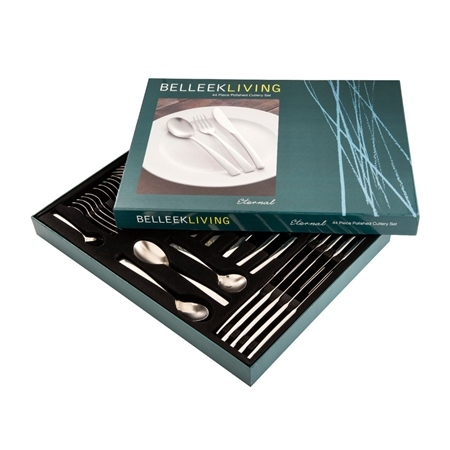 The 44 Piece Eternal Cutlery Set is a fantastic Star Buy from Belleek Living. This beautiful Polished 18/ 10 Stainless Steel cutlery is perfect for a wedding gift, housewarming gift or for everyday use in your own home! The 44 Piece Eternal Cutlery Set comes with a 25 Year Guarantee and is dishwasher safe for everyday use. I will give this as a gift on christmas day. Cutlery set looks excellent. well packaged and delivered at time specified. Unfortunately l received 2 sets on consecutive days and needed to contact you and customer services said it was Belleek error and arranged for collection which took place fairly quickly.